Do certain roles ‘belong’ to certain artists? Are some ballets so intrinsically connected to their original dancers that it becomes almost too daunting for anyone else to step into their shoes? It certainly may have seemed that way when it came to Frederick Ashton’s Marguerite and Armand. Ashton created this one-act ballet in 1963, for Margot Fonteyn and Rudolf Nureyev as their famed partnership was beginning to soar. It was seen as a star vehicle for the lauded couple, and was performed by no one else for as long as the two dancers lived. The ballet’s story began in 1961, when Ashton had begun looking for a theme for a new creation for Fonteyn, the same year a blazingly talented young Soviet dancer, Rudolf Nureyev, defected to the West. Although at that stage, no one could have predicted that the partnership between the two dancers was to become so definitive. Ashton had been considering a ballet on the theme of Marguerite Gautier, the heroine of La Dame aux camélias by Alexandre Dumas fils (the son of the author of the same name who wrote The Three Musketeers). The 1848 novel, later a play, told the story of a courtesan who falls deeply in love with a young man, Armand, only for his disapproving father to thwart their romance. Marguerite, dying from consumption, is only reunited with her true love on her deathbed. It’s a story haunted by regret, which also inspired Verdi's opera La traviata. But what to use as music? One evening in 1962, Liszt’s Piano Sonata in B minor came on the radio and the ballet instantly materialized in the choreographer’s imagination. ‘Almost immediately I could visualize the whole thing in it’, said Ashton at the time. He called up the BBC to find out what the music was. As the choreographer researched the story, he discovered that the character of Gautier was based on a real woman, Marie Duplessis, who in her later years had an affair with Liszt. This seemed to Ashton more than just serendipity. The finished ballet capitalized on Fonteyn’s natural talents as an actress, and its depth lay less in the choreography than in the performances, the character and electric connection of the two lovers, played by the volatile 24-year-old in Nureyev, whose raw charisma unleashed a new wave of passion and freedom in the poised, 43-year-old English ballerina. In Secret Muses, Julie Kavanagh’s biography of Ashton, the author recounts how the couple got carried away with the reckless lifts of the pas de deux, with Fonteyn being flung and swung around the studio by Nureyev. Fonteyn recalled an ‘electrical storm of emotion’ in the studio. Both dancers brought out something exceptional in each other. On opening night, the ballet was greeted with a rapturous response and 21 curtain calls, and it went on to become a signature piece for the couple and was performed around the world. Some doubted the value of the ballet without its stars – ‘Kitsch’, Nadia Nerina called it. Yet other dancers – among them Sylvie Guillem and Nicolas Le Riche, Tamara Rojo and Sergei Polunin, and Zenaida Yanowsky and Federico Bonelli – have since proved that there’s more to Marguerite and Armand than its original performers. For a new generation of dancers, and audiences, the genesis of the ballet has become part of its history, not its lifeblood. We no longer need ask how dancers compare to Fonteyn and Nureyev, but instead how they bring alive the passion, drama, magnetism and doomed love of Marguerite and Armand. This is an edited extract from Lyndsey Winship’s article ‘A Passionate History’, available to read in full in The Royal Ballet’s programme book for Marguerite and Armand. Marguerite and Armand runs 2–10 June 2017 as part of a mixed programme with The Dream and Symphonic Variations. The production will be broadcast live to cinemas around the world on 7 June 2017. Find your nearest cinema. It will also be broadcast live to Big Screens across the UK for free on 7 June 2017. Find your nearest screening. The mixed programme is staged with generous philanthropic support from Julia and Hans Rausing and Sarah and Lloyd Dorfman. Marguerite and Armand is staged with generous philanthropic support from Aud Jebsen and Lindsay and Sarah Tomlinson. Without question the serendipity events of th Ashton, Fonteyn and Nureyev was to place the ballet world at attention. The whole world needed to not only discover what a great form of art ballet was but to see the rich level of what was at hand at this time. I am so ever greatfull to have been around to see the performances of these two giants and what the Royal had become for the world to enjoy. Time has its say for the moment and then we move on to what is yet to come, despite what and who we miss terribly! Thank you! To have seen them many, many times, (after having waited long hours, often in the rain, to get tickets we could afford), has lifted, uplifted, and inspired my whole life since. Not sure why there is a pic of Fonteyn and Nureyev rehearsing 'Corsaire' instead of M&A. Snowdon took some amazing ones in rehearsal. Was excited to see the revival with Guillem/Cope in 2000. 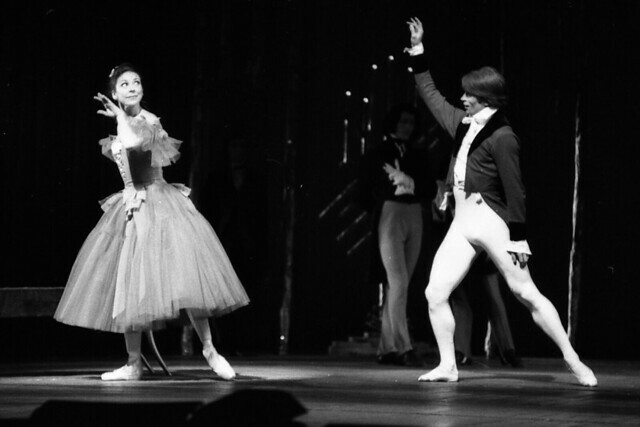 However Armand's first steps are so ridiculously Rudi--I was immediately reminded of something I never got to see, sadly.The version filmed in 'Timotei vision' (c1977) with somewhat ageing Fonteyn and a more mature Nureyev with bouffant hair, does not do them justice. I like Polunin as Armand--he has something of Rudi's panther-like quality. For me seeing one of the final three performances of Romeo and Juliet was one of the most fantastic and memorable evenings ever at the Royal Opera House.